I was wasting a lot of time and money trying to get a deal, and the money I saved always turned into money I would have to spend later, and that’s why I set out to find the best knife set under 200 $. Knife sets come in at all price points, and some of them are really expensive. I’ve found that there are plenty of great ones that come in at or below the $200 mark, and when you break down the price per knife, they’re actually a huge bargain. As soon as I started investing in quality knives, I was so surprised to see what I was missing out on. My knives make me feel like a magician, and I actually have fun working with fresh ingredients to make a meal. Out of the dozens of knife sets that I’ve experimented with, these are my tried and true best knife set under 200 $. When I first saw Victorinox kitchen knife sets, I was a little confused. I remembered that my grandfather used to carry a Victorinox pocket knife, so I always assumed they made camping gear. Turns out, the brand makes any and every high quality blade out of Swiss steel, and they have great standards across the board. This set comes with six standard size steak knives and poultry shears that you can take apart to clean. I like that I can take them apart, because when I use shears to cut fresh garden herbs the lazy way, the leaves and stems often jam up in the top of the blades. I can pop these apart, wipe them down, and snap them back together. You’re also getting a paring knife, a bread knife, a utility knife, a Santoku knife, a chef’s knife, and a sharpening steel. The handles are all slip resistant, and that’s one of my favorite things about this set. I have a tendency to wash and use the same knife several times while cooking. All I need to do is wipe down the handles with a dry towel and I never worry they’re going to slip while I’m chopping. The texture on the handles is so good that I feel like I could even use them with wet, pruned hands. The swivel block is made of walnut, and it’s beautiful to look at. One of the coolest things about the block is the way the back is designed. It has this little ledge and it tilts back. It serves as the perfect place to put a tablet. If you’ve ever wanted to watch cooking videos to learn as you go, or even to watch something on Netflix while you’re cooking, that tablet stand is awesome. I’m completely in love with the fact that the design is not only beautiful, but multi-functional. I reach for this knife set more than I reach for any other knife set I own. It looks beautiful in my kitchen, and it performs flawlessly. These are the kinds of knives I want to use to prepare a holiday meal for a large group of people because they make the job so much easier. The design of these knives is what really drew me in. They’re one solid piece, and the handles are hollow. They look and feel like an industrial tool, almost like an axe or a hatchet, forged from a single slab of steel. I really liked that idea, because I could tell that the knife was full tang and it’s obviously impossible that the handle would fall apart. The set include a Santoku knife, a bread knife, a chef’s knife, a utility knife, and a paring knife. It’s a modestly sized set that includes most of the basics you would need to prepare the average meal. The company has a patent on the design, and I’ve certainly never seen anything like it. At first, these knives kind of feel strange in the hand. The hollow handle creates a weight distribution that I wasn’t really used to, but since the whole knife is one piece, it never feels too light or flimsy. There’s no give when you’re cutting through something tough, like a squash or a raw yam. You’re really able to use your muscles and make the most out of your efforts. This is a smaller set that’s easy to store. The walnut block stores everything vertically, in a very narrow rectangle. It fits anywhere on the countertop, and you can slide it right into a corner if you’re limited on space. It’s not any bulkier than it has to be, so if you’re working in a small kitchen (like one in an apartment), you don’t have to deal with a bulky block or shove the knives in the drawer to save space. These are Red Dot award winning knives, and I absolutely understand why. They perform well, they feel strong, and I don’t have a single complaint about the unique way they’re designed. If this set had steak knives, it would be everything I ever needed. I love the feel of the solid steel, and nothing is a challenge when you’re wielding one of these knives. If you want a serious set that both looks and acts like a professional chef’s knife set, this small package deal really hits the mark. This is a shockingly large set for a shockingly low price, so I absolutely needed to try it out. Six steak knives, shears, a small Santoku, a carving knife, a bread knife, a chef’s knife, two paring knives, a utility knife, a serrated knife, and a paring knife. The block itself is really cool, and it’s one of my favorite things about the set. Each knife slot has an antibacterial sheath inside of it. The knives never really come into contact with the block. I like this two for two reasons – number one, the knives never get dull from rubbing against the wood when you pull them out and push them in, and two, the block never smells sour from water getting into the wood when you put your clean knives away. You can take the sheaths out to clean them, dry them off, and pop them right back into the block. Since all of the slots are the exact same size, you can arrange your knives however you want to arrange them. I like to put the smaller ones up front and the larger ones in the back. I can put them in however I want to, and I don’t need to take every knife out trying to find the one I was looking for. The knives themselves are great. They have versatile handles with slip proof grips. They’re designed to be ergonomic, and the curvature of the handles allows you to hold them however you’d like. The top of the blade on the dull side has this small little indent that makes it easy to perform intricate tasks, like cutting the skin off of an apple, by pushing the blade with your thumb. I even carved a rose out of a pear just to see if I could. I would say that if you’re buying your first ever knife set, this is more than a perfect starter. It’s going to last. It has absolutely everything you could possibly need, and the value for money is outstanding. This knife set is amazingly complete. I love that it has everything I would ever need. I love how easy it is to clean and maintain these knives. If all of my other knives were mysteriously taken away and I was left with just this set, I would have absolutely no problem getting by. 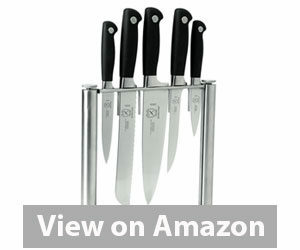 If you only want to buy one set and have everything you’d ever need, this is the perfect knife set for one-stop shopping. This is one of those knife sets with the fancy clear block. You always know what knife you’re grabbing because you can look right through the walls of the block. It’s a great alternative for people who like the way that knives display on a magnet board, but don’t want to store their knives with the blades exposed. The way the block is designed also prevents you from accidentally sawing into it when you’re pulling a knife out quickly, and it also won’t absorb and retain moisture like a wood block sometimes will. This means it doesn’t warp or develop a funky smell over time. The set itself contains a bread knife, a chef knife, a boning knife, a utility knife, and a paring knife. These are all full tang knives with an ergonomic Santoprene grip riveted onto the end. It’s a non-slip grip that’s a little wider in the center. It sits in the palm of my hand and gives me great balance. The blades are a high carbon German stainless steel, and they’re super easy to sharpen. I’m not the kind of person to wait until my knives are completely dull to sharpen them – that takes way too long to do, and I hate feeling my knives getting duller and duller as I use them. It only takes a few seconds to touch up these knives with a countertop sharpener, and they rarely need it. Maintaining these knives is a breeze, and it only takes a few seconds every few weeks. You don’t get a lot of knives in this set, but the knives you do get are great. It’s really just the basics, so it’s great for someone who wants to supplement their knife collection with some reliable and dependable core pieces. This is far from being every knife you’ll ever need, but that might be the appeal of it. It’s really just the specialty knives, so if you already have a drawer full of knives and you don’t want to spend a fortune on knives you don’t need, you’ll find that this set meets your expectations. It’s the perfect supplement for the person who needs a few bigger knives for heavy duty kitchen tasks and doesn’t want to be stuck with duplicates of the smaller knives they already have. You don’t need to know a lot about knives to be familiar with Chicago Cutlery. They’re one of the oldest knife brands, and I noticed that I would see Chicago Cutlery branded knives at nice restaurants a lot. Almost every place that serves up an expensive steak will give it to you with a Chicago Cutlery knife, and that’s exactly how I found the brand. I liked my knife at a steakhouse, and I did a little research. This particular set is really big. You actually get eight steak knives, as well as two different sized paring knives, a utility knife, a boning knife, a bread knife, a Santoku knife, a slicer, and a chef’s knife. You’re even getting shears. Basically, it’s every knife you would need if you had your very own steakhouse. I understand now why restaurants love this brand so much. The coolest feature about the block is the little slot on the right. It’s a pull through knife sharpener. It’s perfect for touch ups on the blade. If you don’t want to take out a separate tool, you can put a new edge on a knife in just a few seconds. The slot is universal fit for every knife in the set, so everything is really easy. It’s a foolproof design feature that makes my life a lot simpler. The knives are full tang, and the grips are an ergonomic polymer. They don’t have much of a texture, but the shape of the handle itself prevents them from slipping around in your hand. What I love most about the design of the knives is that only the bread knife is serrated. The steak knives have a straight edge, which I vastly prefer for cutting meat. It doesn’t rip a beautiful steak into shreds – it cuts it like it’s warm butter. I think this is the perfect knife set for a large family. If you have more than four or six people to feed and you want them all to be able to use a decent knife to cut their meat, that’s where this set comes out ahead. There’s enough steak knives for everyone, and they all match. Since the block also sharpens the knives, you don’t need to buy anything else. It’s all ready to go. I love all of these knife sets, and I love them for different reasons. The knife set you should choose ultimately depends on how many knives you actually need, as well as how many people there are in your household. I find myself going back to each and every one of these blocks to pull out my favorite knives, and you’re bound to find a favorite in any set you choose. Am I Better Off Buying a Set or Just The Knives I Need? What Makes Expensive Knives Better Than Cheap Ones? What Knives Should I Look For in a Set? What Do I Use The Knives For? Do I Need Any Accessories With My Knife Set? Even though $200 is rather affordable as far as knife sets are concerned, it can still be a lot of money for people on a budget. Before you drop all your hard earned cash on knives, you want to make sure the knives you buy are going to be worth the money and last you a long time. When you’re deciding what kind of knife set to buy, there are a few things you’ll want to consider before you make a decision about which set is going to be the best possible investment for you. Research never hurts. A lot of people avoid buying knife sets because they don’t think they’re going to use all the knives. People who aren’t serious about cooking have a tendency to buy a decent chef’s knife and expect that it will do everything they need it to do. The only problem with doing that is using the wrong knife for the wrong job can actually make your life harder, or ruin the knife. If you’re trying to cut something like a pumpkin with a serrated bread knife, you’re going to be very miserable. You’re also going to cut yourself at least a dozen times. Trust me, I’ve been there. The bandages come to be just as expensive as the knife. You really do need a knife for every specific kind of job. If you’re a vegetarian, you probably don’t need a boning knife or a fillet knife, but you’ll need just about everything else that would come in a set anyway. At the end of the day, it just doesn’t make sense to buy each knife individually. The sets usually come with blocks, which are specifically to organize the knives. Storage is much easier, but that’s not all. There’s also the cost advantage. When you buy a set, everything is value priced. When everything is bundled together, the cost breaks down to a lot less per knife. A lot of the times, when you crunch the numbers, the block works out to be practically free. 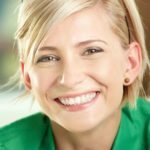 It might look like you’re spending a lot of money at first, but when you consider the individual value of everything in the kit, you’d be surprised to see how much you saved. 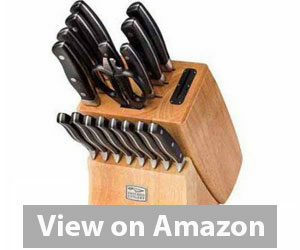 Just divide the total cost of the knife set by the number of knives in the kit. Those knives will probably be more expensive if you bought them separately. That’s why the set is the best bargain. The difference between bargain knives and the more expensive knives is the handle and the quality of the metal. Good metal is expensive, such as the stainless Swiss or German steel that a lot of high end knife brands use. Cheap knives are made of the lowest grade of steel that can be sharpened, which is 420 steel. It’s really soft, which makes it easy to put an edge on the blade. It also makes it easy for the blade to chip, and since the blade dulls quickly, you need to sharpen it a lot. That sharpening leads to more chips, and the blades fall apart. They get jagged, and they become difficult to use. A lot of the times with cheap knives, they aren’t full tang. The blade stops somewhere in the plastic handle, and that plastic can crack. The knife can actually fall apart if the handle and the blade aren’t the same piece of metal. If they come apart while you’re using the knife, that can result in a pretty nasty accident. Full tang hard steel knives just don’t break the same way cheap knives do. You can keep putting a new edge on them without having to fear that you’re bringing the knife closer and closer to its demise. You don’t need to replace them – a great knife can last for decades if you take proper care of it, and a cheap knife will wind up in the garbage after a few months. 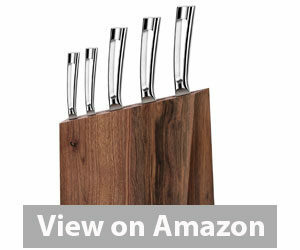 If you don’t already have a set of steak knives that you really like, choose a knife set that includes them. 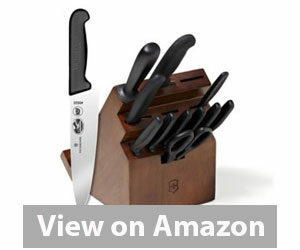 It’s a lot less expensive than purchasing a whole set of steak knives separately, and you have the added bonus of getting a storage block that will keep them organized with the rest of your knives. Most knife sets come with a Santoku knife and a chef’s knife, which serve similar purposes but work a little differently. You’ll want to have one or the other, if not both. Paring knives and utility knives are also important. You’ll definitely want a serrated bread knife, since you can’t use any other kind of blade to cut bread without ruining it. Boning knives are great if you cook a lot of chicken. Some knife sets come with shears which are great for cutting chicken the lazy way, or even chopping up fresh herbs directly into a pot or pan. 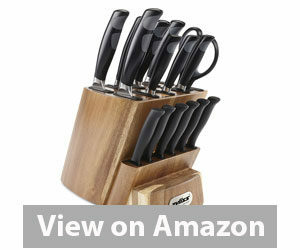 Most knife sets come with steak knives, and the value of those is easy to figure out. Whenever you’re serving meat or something that can’t be broken apart with a fork, you want to have a steak knife to eat with. Santoku knife, which is used for dicing, slicing, and mincing. The name is a Japanese word that means “three virtues”, because it’s a knife designed to do three things. These knives are great for vegetables, no matter how you intend to cook them. The hollow oval shapes around the blade of a Santoku knife make it easy to cut cheese, or anything else that might stick to a flat, smooth blade. Chef’s knives are very similar, but they’re designed differently. The biggest difference between a chef’s knife and a Santoku knife is that a chef’s knife is designed to rock back and forth. A Santoku knife is meant more for chopping, where you swing the knife like a cleaver. With a chef’s knife, you put it down, rock is back and forth, and just push something like a cucumber underneath it. It works fast, but it’s not as detail oriented as a Santoku knife. A paring knife is something that most people don’t realize they need until they don’t have one. It’s a really small blade, but it definitely comes in handy. If you want to peel a boiled potato or remove the skin from any vegetable, that’s where a paring knife comes in handy. They’re also great for cutting citrus fruits into segments, or thinly slicing small things like garlic, cherry tomatoes, pearl onions, olives, and shallots. A utility knife is right between a chef’s knife and a paring knife in size. A lot of people use utility knives for cutting thinner or smaller vegetables, like carrots or fresh string beans. Their size makes them ideal for trimming the fat off of chicken, since they give you enough precision to get the job done without hacking up the lean meat. A boning knife isn’t something that everyone will use, but it’s extremely helpful for people who try to cook the majority of their own meals. It’s used for cutting steak from the bone or separating the joints in a chicken. It can also be used to make boneless ribs, by cleanly slicing away the meat. A lot of people use boning knives to remove the skin from fresh fish fillets. Bread knives have a flat top and a serrated bottom. If you were to try to cut bread with a normal knife, you’d just squash it. The bread is too soft and it doesn’t have a forgiving texture. The serrated knife allows you to use sawing motions to uniformly cut through the loaf of bread without destroying it. The block is technically an accessory, and almost every knife set comes with one. It’s not something you need to think about purchasing separately. Some knife sets come with a sharpener that’s designed to be used with the knives. Sometimes, the sharpener is built right into the block. Ultimately, that sharpener is the most important accessory, because you need it to maintain the sharpness of your knives. If the knife set you buy doesn’t have one, you’ll want to find a sharpener that’s compatible with the kind of steel your knives are made out of. General use sharpeners have a tendency to be a bit rough, and you don’t want to cause burrs to pop up on your blade. The brand who made your knife set probably makes their own sharpeners, so try to find one by the same company. You won’t need to worry about whether or not the sharpener you choose is any good for your knives if they’re both manufactured by the same brand.